NOAA and NASA released their joint climate summary for 2018 for the globe today. The report shows that 2018 was the 4th warmest year on record for the earth as a whole, and the last five years were the 5 hottest on record. The US experienced 14 disasters with damages that were $1 billion or more. In the Southeast, we had hurricanes Michael and Florence as well as the severe weather outbreak of March 18-21. 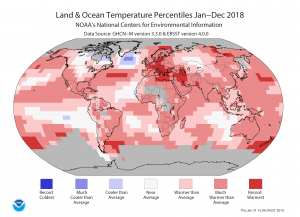 You can read more at https://www.noaa.gov/news/2018-was-4th-hottest-year-on-record-for-globe.